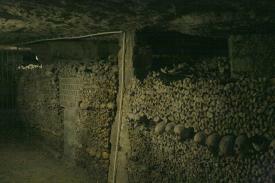 The Catacombs Beneath Paris: The Spookiest Place in Paris, Maybe even France! Tigger Travels - Family Adventure Journal Photos From Tigger`s Travels and MORE! Centuries ago, a tunnel was dug into the limestone beneath Paris.��The tunnel was used to mine building material for the growing demands of those living in Paris. Later, those tunnels were expanded by a monk to supply water for Paris in times of siege.��Over the years the tunnels grew into an extensive network of miles of tunnels. 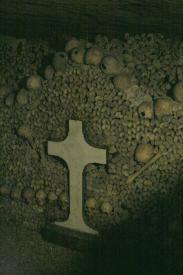 After the plague hit in the 1700s, graveyards were literally bursting at the seams.��When rain fell hard, bodies were washed into the basements of neighboring homes.��It was decided to empty the graveyards with all dignity.��The massive project moved 6 million bodies under the authority and watchful eye of the church leaders. Past these doors, enter in to a scene from a macabre horror movie.��Walls of bones on either side stacked nearly 6 feet high holding back millions of other bones. 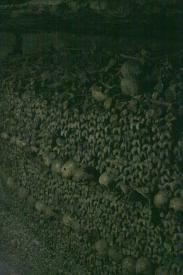 These tunnels filled with bones go on for miles, though it is only a small portion of the overall collection of tunnels. 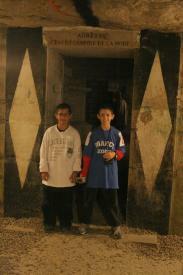 You will get the opportunity to walk over a mile of these tunnels. While you are there, out of respect, there is no flash photography.��If you use a flash, you will be asked not to do it again. It was obvious who the disrespectful American tourists were.��As a fellow American, don't act so stupid. It is not a place for the faint of heart to visit.��We did bring our boys at age 10 and 12.��They are pretty tough kids and only had a small amount of concern near the end of the seemingly endless tunnels. After you leave the catacombs portion, don't forget to see the bottom side of some pretty large sink holes.��These tunnels have made a lot of weaknesses in the earth under Paris.��These weaknesses have prevented any new buildings (skyscrapers) from being built.��The ground cannot support them. The visit will take a couple hours and requires a descent and climb of a very tight spiral stairway.��Jennifer has a little claustrophobia and she just started to feel it on the way up. 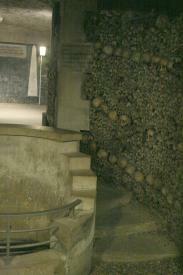 To get to the catacombs, you can take the Metro lines 4 or 6 to Denfert Rochereau.��The Metro stop is near the entrance, however, the bus gets you closer. Bus 38 will drop you off right across the road from the entrance.��Looking at the entrance, there is a very large statue of a lion to the left.